Yesterday I showed the rate of bank failures from 1980 to 2009. Today I'll look at the failures in 2008 & 2009 per month. You can find information on bank failures at FDIC's page on Historical Statistics on Banking. 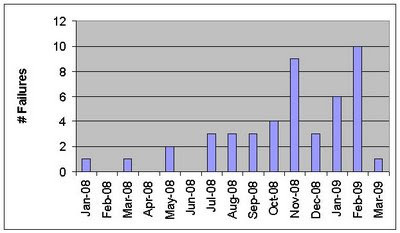 From July 2008 to February 2009 it looked like bank failures might be increasing. But so far in March 2009 we've only had 1 failure. That could be a good sign.